While we all know and have likely experienced acne, the explanation of how and why we get pimples can often elude us. All acne is a disorder of what we call the pilosebaceous unit. The pilosebaceous unit consists of the hair shaft, the hair follicle, the sebaceous gland, and the erector pili muscle (which causes hair to stand on end when it contracts). These units are found everywhere on the body except the palms, soles, top of the feet, and the lower lip. The density of these units is greatest on the face, chest, and upper neck, where acne breakouts are most likely to occur. Sebaceous glands produce an oily substance called sebum, which is responsible for keeping the skin and hair moisturized. During adolescence, sebaceous glands will typically enlarge and produce more sebum under the influence of hormones. After the age of 20, sebum production tends to decrease as hormone levels stabilize and then fall, accounting for why acne is such an integral part of a person’s teen years. Acne can also be triggered by other conditions, such as pregnancy, ​when hormone levels are more apt to spike and fluctuate. A bacteria known as Propionibacterium acnes is a normal inhabitant of the skin. It uses sebum as a nutrient for growth and will continue to grow in line the production of sebum. As such, people with acne will inherently have more of P. acnes in their follicles, as well as more oils on the skin to feed the bacteria. The presence of the bacteria itself attracts defensive white blood cells to the follicle. These immune cells produce an enzyme that damages the wall of the follicle, releasing debris into the hair shaft and deeper in the middle layer of skin to (the dermis). This process causes an inflammatory reaction that gives rise to a little red bump (called a papule), which can then develop into a pus-filled blister (called a pustule). The pus itself is essentially the casualties of the immune response, containing oils, dead immune cells, dead skins cell, and dead bacteria. Normally functioning pilosebaceous units maintain a careful balance of moisture on the skin. It works like this: sebum produced by the sebaceous gland combines with cells being sloughed off by the hair follicle. As the oils "fill up" the follicle, they are steadily distributed over the surface of the skin, keeping it moisturized and healthy. Problems arise when the sebum is trapped inside the follicle. For reasons that are still unclear, some follicles can become obstructed, often around the nose or balls of the cheeks. When this happens, the sebum and sloughed cells begin to build up and become sticky, blocking and eventually hardening within the pore. This can cause lead to a type acne called comedones, commonly known as blackheads or whiteheads. 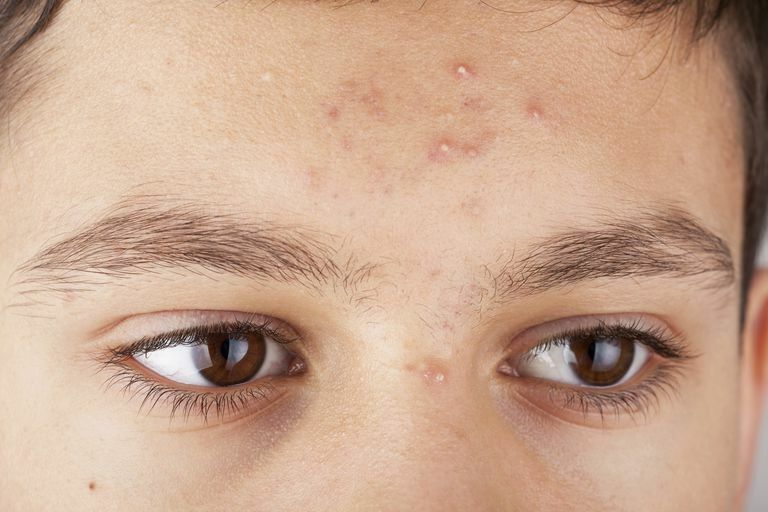 If experiencing persistent or severe acne, you will likely need to see a dermatologist to get the condition under control. While over-the-counter products containing as salicylic acid and benzoyl peroxide can help treat mild or occasional outbreaks, more severe cases may require prescription-strength creams, antibiotics, or even oral contraceptives to fully rein in this often confounding dermatological condition.